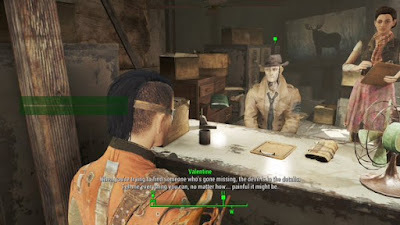 - Head to Valentine Detective Agency in Diamond City after completing Unlikely Valentine, whether you followed Nick directly back or not. Ellie, his secretary, will reward you with a few items: a Worn Fedora, a Faded Trenchcoat, and 100 Bottlecaps. Nice. Persuade Geneva to give you the Key. You’ll need a decently high Charisma for this to work. Bribe Geneva to give you the Key. Say goodbye to 250 caps. Find the Key yourself. If you visit the mayor’s office at night Geneva won’t be at her desk, and you can sneak into the large office directly behind her desk. The Mayor’s Safe is back here, and you can pop open its Advanced lock to get the Key. This still requires unlocking Perks, but they’re a sight bit easier than Master-level skillz. - Regardless of how you did it, you’re in! Have a look around. The main house is pretty drab, and there’s very little to steal - though you can find something more interesting if you dip under the desk on the first floor. There’s a button here that will open a nearby wall. This hidden room contains a decent store of ammo, a few Stimpaks, and San Francisco Sunlights. Grab these last ones to trigger some dialogue. - Nick suggests bringing Dogmeat in on the case, and you do indeed need the pooch to complete this quest. You’re also given the option to add Nick as a companion from here on out, as well as keep him on your team for the rest of this quest… which, it turns out, lasts as long as stepping outside the door, ‘cause Dogmeat’s out here. Speak to the lovely puppy to complete the quest, as well as trigger the next: Reunions.